In Food History 101, we're hitting the books -- to explore the who, what, when, where, and why of what we eat today. Today: The history of America's favorite sandwich. 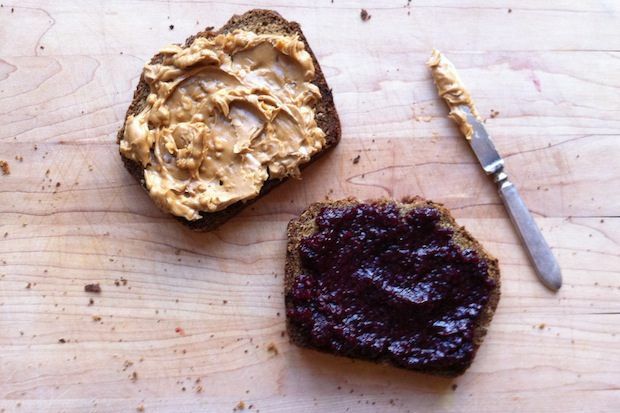 There's something eternally satisfying about a peanut butter and jelly sandwich. For many of us, preparing one was our first foray into the kitchen -- and, hell, during our pickiest phases, the only thing we would eat. And though we've since expanded our culinary repertoire, we still can't resist packing one for lunch on occasion. The flavor combination is inarguably sublime, but it's not necessarily intuitive. So where did the PB&J originate? The very first recipe published comes from Julia David Chandler in an article she wrote in the Boston Cooking School of Culinary Science and Domestic Economics on Peanuts and Pralines. "For variety, some day try making little sandwiches, or bread fingers, of three very thin layers of bread and two of filling, one of peanut paste, whatever brand you prefer, and currant or crab-apple jelly for the other." At the time, peanut butter was considered a delicacy, served exclusively at high-end tea-rooms, where it was often paired with pimento, cheese, celery, or meat. As the industry that produced peanut butter commercialized, the price of the product declined and it became an affordable good enjoyed by all classes. Here's to accessibility. My family loves the PB and Cheese sandwich... I love learning that it has elegant roots. This was one of a few typical "kid foods" I never liked as a child. I think what was missing was the Health Loaf from Kara's Bakery in Bushwick. Two slices, toasted, plus pb&j is something near to nirvana.